Our Elder Law practice is dedicated to aging issues. Each day we see the unfortunate truth that for seniors living longer doesn’t mean they are living better. Aging causes declines in physical and cognitive abilities which makes seniors more vulnerable to becoming victims. “Elder Abuse” can happen to anyone – a loved one, a neighbor, a parent. And when we grow older, it can even happen to us. Every year, 5 million Americans are victims of elder abuse, neglect or financial exploitation. For every reported case, experts say 23 cases go unreported. For those affected with some form of dementia, one half will become victims. The most terrible reality is that 90% of those perpetrating the abuse are family members! This week, on Thursday June 15, countries around the globe mark the 11th anniversary of World Elder Abuse Awareness Day (WEAAD). WEAAD was launched in 2006 by the International Network for Prevention of Elder Abuse and the World Health Organization at the United Nations to provide an opportunity for communities around the world to promote a better understanding of abuse and neglect of older people. Why is Elder Abuse identified as a significant global concern? All countries expect to see substantial growth in the aging population. In the United States, the number of older Americans continues to swell. By 2030, 72.1 million older people will comprise one-fifth of our population. With the increase in this population, the occurrence of elder abuse, neglect or financial exploitation grows too. As advocates for the elderly here in Tampa, Florida, we believe it is not simply enough to know about this important date. Our attorney are activists who help seniors. Recognized as experts by their peers across the nation and in our local community, our attorneys see WEAAD as a call-to-action for society’s individuals, organizations, and communities to educate each other on how to identify, address and prevent abuse so we can all do our part to support everyone as we age. When it comes to excellency in advocacy, have you seen our firm’s recent recognitions? 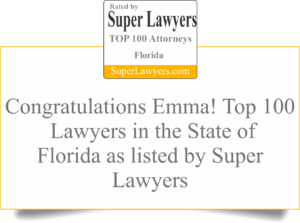 Our own Attorney Emma Hemness was just included in this year’s Top 100 Florida Lawyers from Super Lawyers 2017. Out of more than 100,000 licensed attorneys in the state of Florida, Attorney Emma Hemness is in the Top 100! Everyone can protect seniors. No act is too small. Just begin with educating yourself that there are different types of abuse. Then, become familiar with the warning signs. The Law Office of Emma Hemness encourages you to act. Here are 3 easy steps: 1) Know It. 2) See It. 3) Do Something About it. Number 1 – Know It. Take a moment and educate yourself on the types of Elder Abuse. Number 2 – See It. Recognize what elder abuse looks like and see the red flags, identify the warning signs. Number 3 – Do Something About It. Help save a victim from further abuse by reporting what you have seen to our State Agency. You can do this anonymously. In addition to elder abuse as a crime against the elderly, there are civil actions which can be taken against persons financially exploiting the elderly or other vulnerable individuals, like persons with disabilities. If you believe someone is being financially exploited, even if the abuser is in a position of authority, such as Power of Attorney or Guardian, get involved and stop the abuse. We can help. Our team of experienced attorneys have years of experience in protecting our elderly clients under these sad circumstances.